Ravensdale, in Southeast King County, is marking the centennial of the day 31 coal miners died in one of the state’s worst mining disasters. Explore our interactive animations to learn more about the tragedy's history. RAVENSDALE, King County — Thirty-one faces, each in its own oval frame, stare silently out from a black-and-white photo display. Some are clearly workmen, wearing helmets with lights. Others are in jackets and ties, some with fedoras tipped at a jaunty angle. If these faces could speak, what would they say about the Tuesday afternoon in 1915 when they perished together in a South King County mining disaster never fully explained? 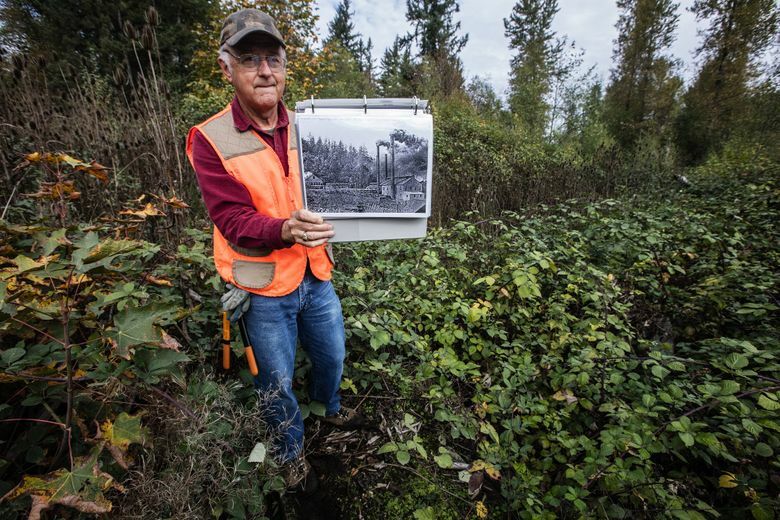 11 a.m. Monday: A ceremony commemorating the 100th anniversary of the Ravensdale Coal Mining Disaster, and the dedication of the Ravensdale History Trail Interpretive Signs. At the Gracie Hansen Community Center, 27132 S.E. Ravensdale Place. How would they describe the underground explosion that rocked the town, and the roaring fireball The Seattle Daily Times likened to “the heat of a thousand furnaces rolled into one”? In that instant, they wouldn’t have known that this blast, which created 20 widows and left 36 children fatherless, would be the undoing of this booming young coal town — the only legally incorporated King County city ever to dissolve. Nor could they have known that a century later, the tragedy might spark hopes for a rekindled sense of community. Those words, in The Seattle Daily Times the day after the blast, came from Mike Ferlich, one of the explosion’s three survivors. Another worker, John Errington, made it out of the mine only to die a short time later in a temporary hospital set up in the washroom of Ravensdale’s only hotel. The rescue effort drew workers from nearby Black Diamond, and later from Cle Elum and Roslyn. They tried to reach the remaining 30 workers via an auxiliary shaft, using canaries to test if the air was safe. But as hours passed and the extent of destruction became clear, the sad reality of what had happened 1,500 feet below ground sank in for the relatives, co-workers and townspeople above. 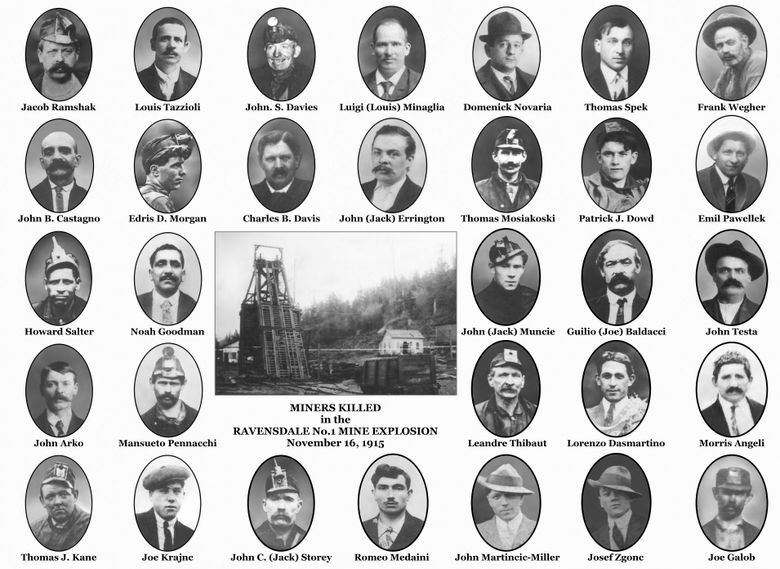 Ravensdale’s past will be honored Monday, the centennial of the explosion. 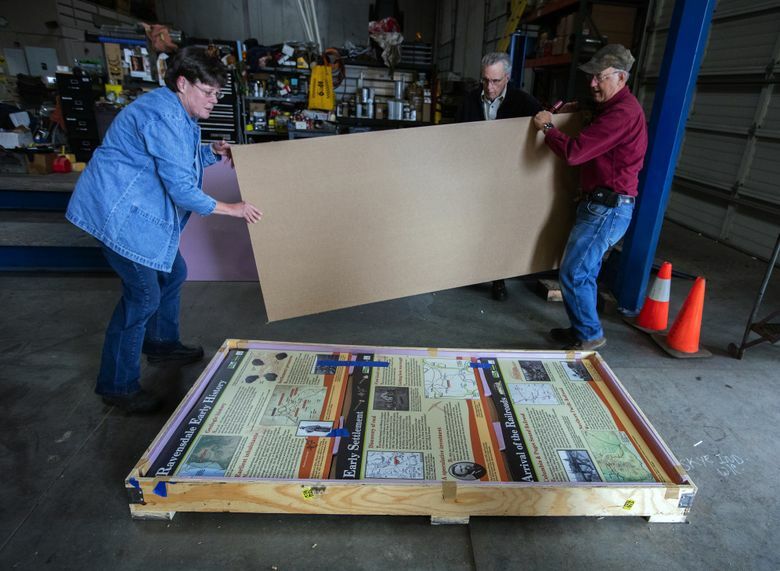 The 11 a.m. gathering at the Gracie Hansen Community Center, with King County Councilmember Reagan Dunn on hand, will dedicate a set of 15 interpretive signs in the recently upgraded Ravensdale Park. The signs depict key aspects of the area’s history. The project was fueled by $22,000 in grants and a yearlong volunteer effort, including 2,000 hours of work by retirees Michael and Donna Brathovde, Ravensdale area residents since the 1970s. One of the signs bears the faces and names of the lost miners. Coal mining has always carried risk, but in the late 1800s the burgeoning West was hungry for this portable source of energy — “Imprisoned sunshine,” a Washington state mine inspector called it in 1893. 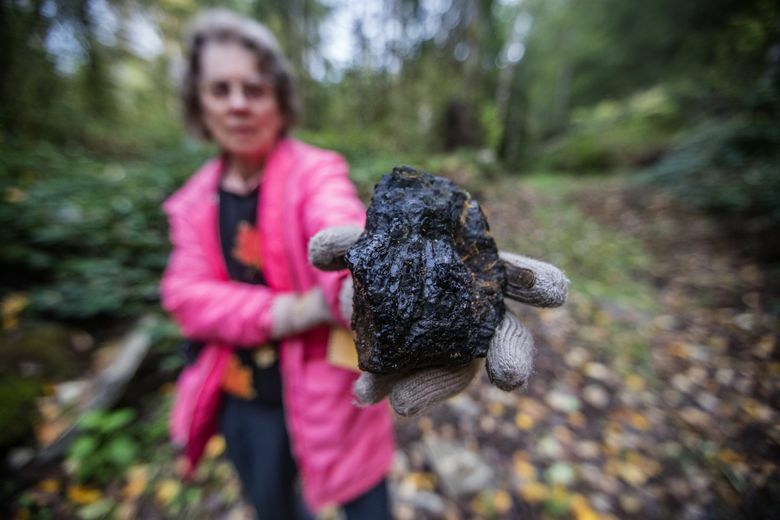 Despite Ravensdale’s high-quality coal deposits, Michael Brathovde said, mining didn’t become financially feasible until the arrival of a railroad line in 1900, 16 years after coal production had begun in nearby Black Diamond. As at other mines in the area, Ravensdale’s workforce was one made up primarily of immigrants. Donna Brathovde, who researched genealogical records of the victims, said only five of the men who died had been born in the United States, with the others coming from Italy, Austria, Wales, England, Germany, Belgium and Russia. The mining company, created by the Northwestern Pacific Railway, owned not just the mine, but the town of Ravensdale itself, including a store, hotel, bunkhouse, houses, ice house, pool hall, barber shop, churches and jail. For gambling and liquor, the miners went to adjacent Georgetown, which was outside company ownership and had at least a half-dozen saloons. As deadly as the blast was, Brathovde noted, the death toll could have been much higher. Only hours before the explosion, more than 100 miners had been sent home for the day because an electrical problem had disabled hoisting equipment, a malfunction not believed to be connected to the blast. The lost miners included an array of prominent residents. Thomas Kane, the mine foreman, also served on the town council. Jack Muncie managed the local baseball team, and Charles Davis headed the local school district. 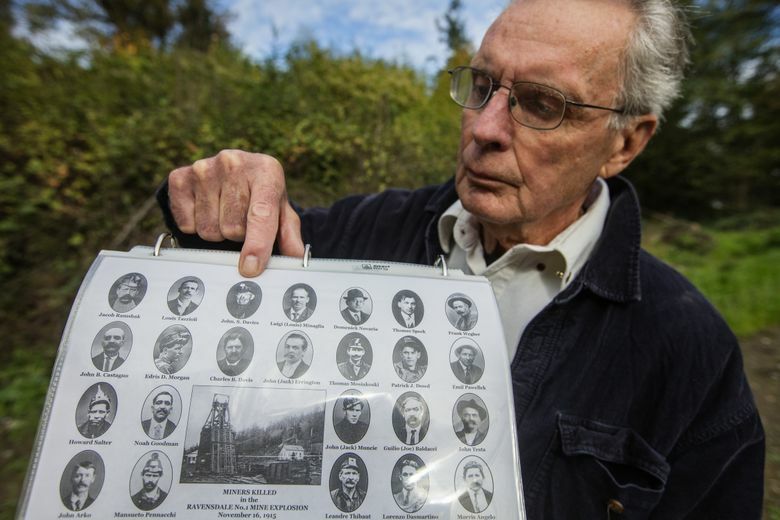 These days, not many current Ravensdale residents trace their lineage back to the mine victims. But one who does is Gary Habenicht, great grandson of the blast’s oldest victim, John Davies, 63, a Welsh immigrant. 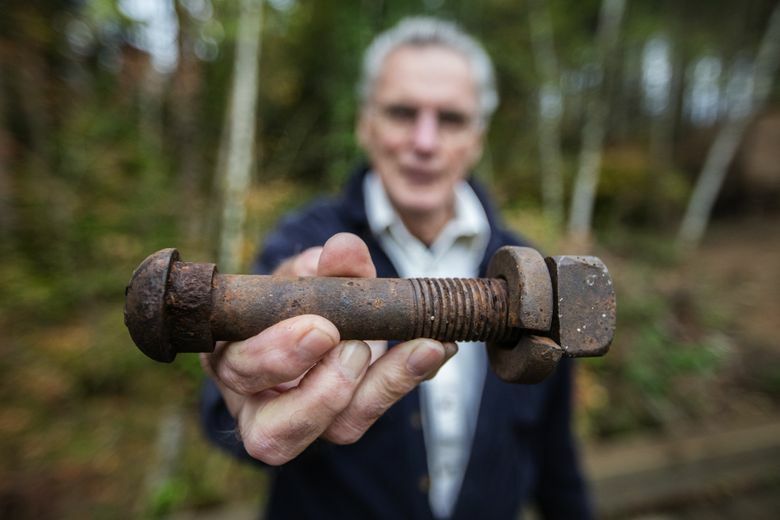 Habenicht, 73, wishes he knew more about his ancestor, partly because the few things he has been told suggest a good story — the tale of a man drawn to the area not by his wallet, but by his heart. Mining was not Davies’ first career. Habenicht said the family story is that Davies had been a federal marshal in Wyoming, sent to Washington state to retrieve a fugitive. During his stay, the story goes, Davies fell in love with a young woman. So he returned his prisoner to Wyoming, came back to Ravensdale and took a job at the mine. 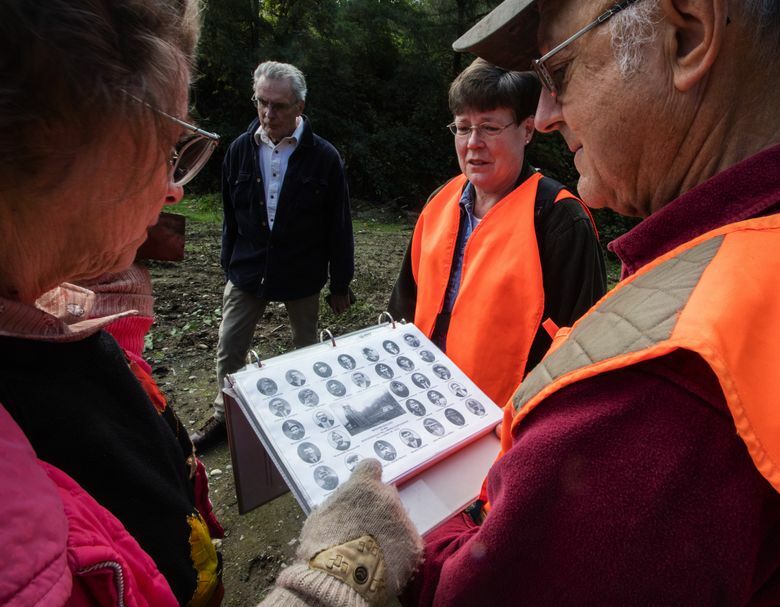 The youngest miner to die was Joe Krajnc, 21, from what then was called Austria-Hungary, said JoAnne Matsumura, a longtime volunteer with area historical groups and a key resource on the Ravensdale sign project. Another unusual family twist in the mine story involved the need for a court to determine which of two victims died first: superintendent Kane or miner Patrick Dowd, a relative. Dowd had taken out a $1,000 life-insurance policy on himself, naming Kane as the beneficiary, an expression of gratitude because Kane’s family had raised Dowd from childhood in Pennsylvania. But the payment — equivalent to more than $23,000 in today’s dollars — would go to Kane (or his heirs) only if Kane were still living when Dowd died. A year after the blast, a superior-court judge ruled that indeed Dowd, who was crushed in the blast, had died before Kane, who was found sitting at a desk in a fortified underground office, his mouth and nostrils filled with dust — indicating he at least had time to draw a breath before succumbing. Historical records don’t answer the key question posed by the disaster: What caused it? In a mine containing volatile coal dust — and where dynamite was used to blast into coal deposits — there’s always the possibility that a blast could go wrong, triggering a fireball in the mine. News accounts also reported that an open miner’s lamp may have touched off a small gas explosion, which then ignited a larger coal-dust blast. In addition, a coroner’s jury inquiry found that the pockets of some of the miners had matches, matchboxes and a pipe — all in violation of state mining laws. The number of deaths overtaxed a state fund that had been created to compensate families of workers killed on the job. Donations to help out came from the United Mine Workers, along with other labor groups and community organizations. A benefit ball was held in Everett, and students at a Queen Anne Sunday school sent $3.12 from their collection plate. 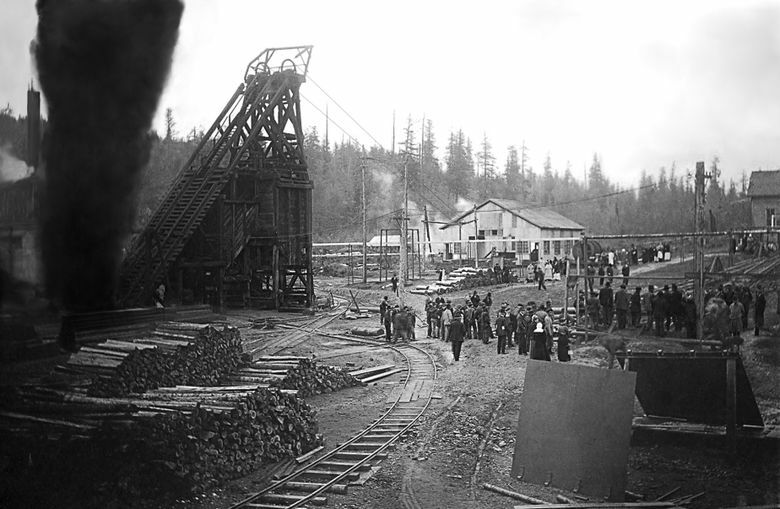 Ravensdale Mine No. 1 never reopened because of the severity of the damage and, some sources suggest, the falling price of coal. Instead, the mining company moved its equipment and many of the town’s buildings to its operation in Roslyn, just across the Cascade crest. Roslyn, by then, had already incurred the state’s greatest mining disaster, an 1892 explosion that killed 45. With the closure of the mine, Ravensdale’s population plummeted from a pre-blast high of more than 1,200 down to fewer than 200. And sometime in the 1920s, the locals who remained failed to renew the town’s incorporation status. King County records list only one other town, East Redmond, that has ever disincorporated. But accounts indicate that came as a result of a 1964 judge’s ruling that the 1956 incorporation had not followed applicable law. 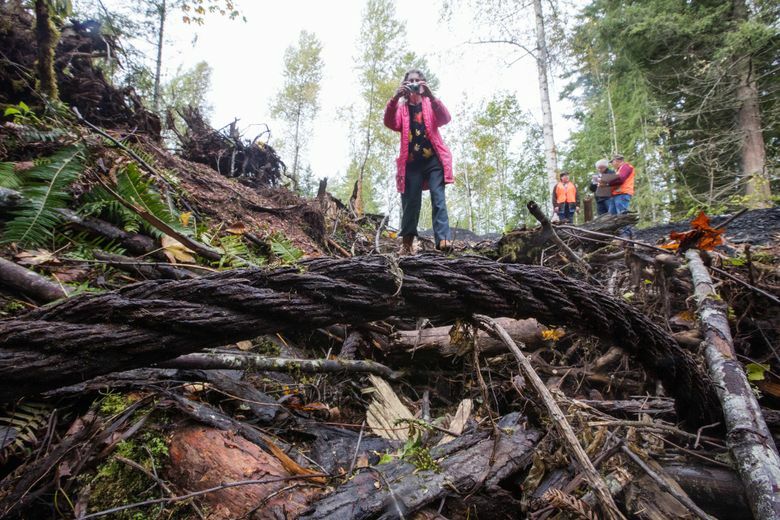 Most traces of the ill-fated Ravensdale mine were obliterated by a strip mine that operated from the mid-1940s to the 1950s, Michael Brathovde said. In addition to the sign project, which received grants from King County and the Ravensdale Park Foundation, Monday’s event will acknowledge improvements and an expansion at Ravensdale Park. Longtime Seattle residents may wonder about the name of the Monday’s venue, the Gracie Hansen Community Center. Yes, it is the same building that housed Hansen’s controversial burlesque revue during the 1962 Seattle World’s Fair. But, no, the town did not get it from Hansen. The fair donated it to the county, and the county granted it in 1963 to Ravensdale, where it was reassembled. Although Ravensdale ceased to exist as a municipal entity, it gradually regrew in population and today has roughly the same number of residents it had at the peak of its mining days. Michael Brathovde’s lament is that it has grown largely as a “bedroom community,” with residents going elsewhere to work, shop and play. The efforts made to mark this centennial will pay off, he said, if they contribute to a heightened sense of area identity.